We started our vehicle conversion by doing exactly what everyone would expect us to do: we removed all the seats from the school bus. Later we'd have to re-install one school bus bench, a drivers seat and a passenger seat. The school bus design gave the bus 'stepped' flooring. Some people, when they convert one of these buses to an RV just work around that. But we pulled the floor out, the only place we'd need a step up was for the wheel arches. Even the wheel arches were taking up more space than they needed to, which we couldn't change on the outer wheel (that would make ugly viewing from the outside of the bus where the arches go over the wheels), but we could alter somewhat for the inner arch (the bus has dual wheels at the back). We actually did look into the prospect of changing the back dual wheels to singles but found it would be too difficult, extremely expensive, and might not get approved after all that. The left rear wheel arches are now in the wardrobe, and the right are partly in the shower and partly in the toilet area. None are in the way. Also, the original design had a step down at the door. The door was a bi-fold style door, terrible for sealing and taking up valuable space. So the door was removed and the floor could be made level there too. The replacement door design, and needed steps took a lot of figuring out. I plan to cover that in a whole other post. H also wanted to make our floor with a double layer of 16mm PVC foam (we used PVC foam for most of the work), so by pulling everything up he could do this. In the end we have a (mostly) level floor and it looks and feels good. 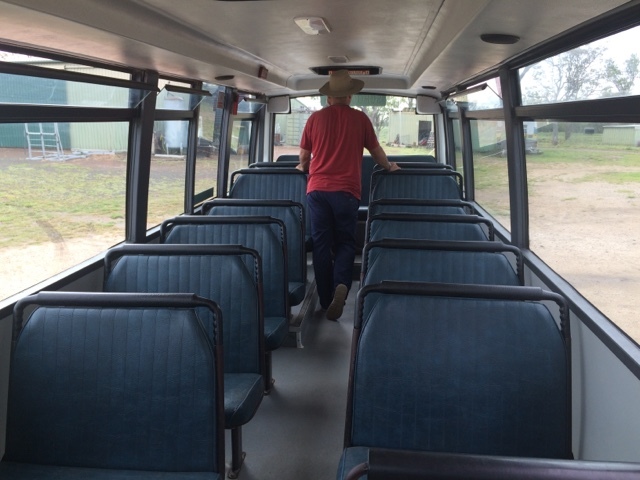 The original Mercedes Denning School bus interior. 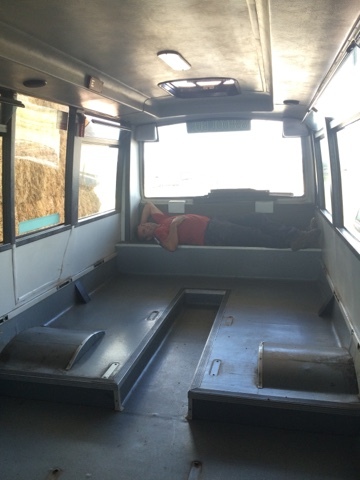 We first removed the seats and then the windows. H showing that the bus is wide enough to sleep across. This is the original floor plan of our (ex-school) )bus. 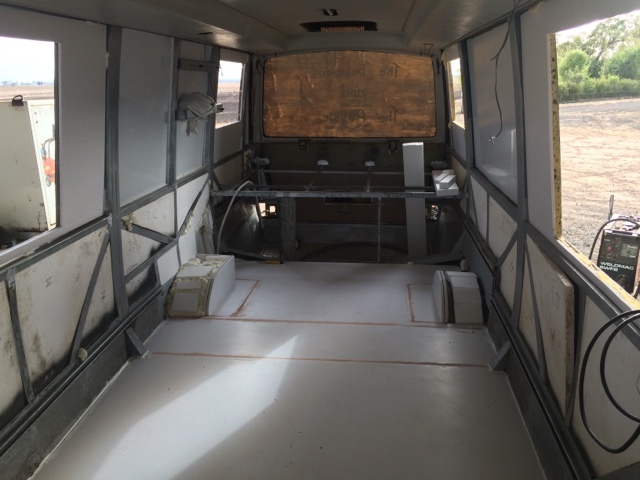 The original floor and windows replaced for our motorhome conversion. This was when we thought we could change the dual wheels to singles. Later we modified it again to have additional arches to accomodate the dual wheels.